In many ways your kitchen is as much a focal point of your home as the living room or other “public” gathering spaces. Because of this, choosing the right design for your kitchen can make the space more efficient and inviting, encouraging friends and family to mingle while making food preparation and cleanup more seamless. There are a number of factors to consider when planning kitchen design, each of which directly impacts the form, function and layout of your new kitchen. In this article, we will examine key points every homeowner should consider when undertaking a kitchen remodel or new build. This is particularly relevant during a remodel because the available space is pretty much set unless you can knock out an interior, non-load-bearing wall for more room. The arrangement of the plumbing, gas and electric lines will largely determine where everything goes in the kitchen. During a renovation or remodel this could be a problem, but in a new build where everything is being designed from scratch you can arrange cooking, cleaning and storage spaces to suit your needs. A standard design is “fridge, sink, stove,” but personal preference is always the overriding consideration. 3. Let there be light. There is rarely such a thing as too much light in a kitchen. Natural light from picture windows and French doors is a good way to let in daylight and give the kitchen an airy feel. 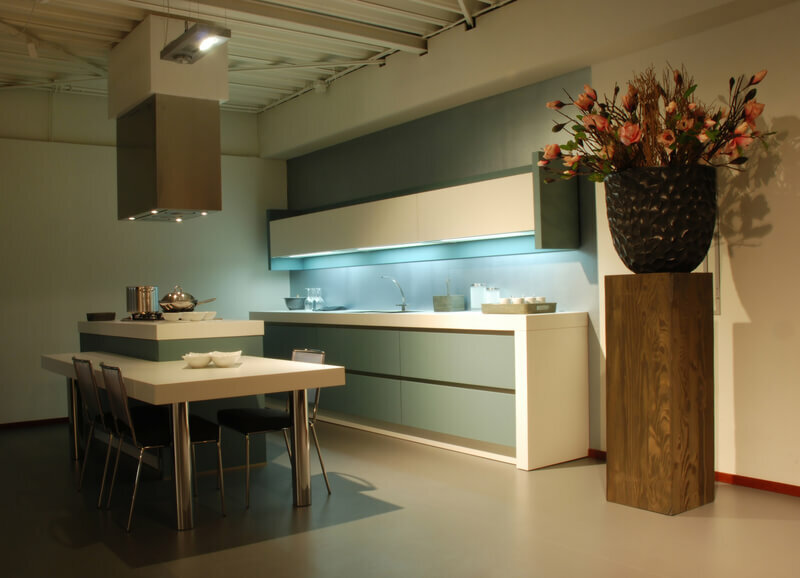 At night, drop lights and recessed high-intensity task lights can shed as much or as little light as desired for a more intimate atmosphere without compromising visibility while cooking and cleaning. 4. Should we put in a hood? Many ranges require hoods to vent heat and steam out of the work area, and this should be considered in the design. However, the hood should blend into the walls using simple lines in a color that fits with the other decor. Otherwise the hood may become the focal point of the kitchen, drawing attention from the intended center. 5. What about an island? If space is available, an island is a great way to incorporate a work space and sitting area in one. This also breaks up the floor space and creates a subtle demarcation between the social and work areas while keeping the kitchen unified. Especially in a new build, a great way to add more visual space to the kitchen is to have it adjoin the patio or deck for barbecuing or outside dining on a summer evening. This gives the feeling of your entire backyard being a natural extension of your kitchen and makes it feel much larger. 7. Work up a budget. For remodeling especially, a budget is essential. Decide what the most important items and focal points are and go all out on those, cutting corners elsewhere. Islands and ranges are often ranked highest, but some people just love the idea of a custom back splash.